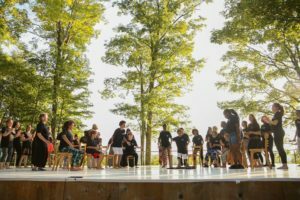 When Jacob’s Pillow director, Pamela Tatge, came to us last year about a community building grant opportunity, it was unclear what would really take shape. The question: Can you build community through movement? If yes, then how? From it, Pittsfield Moves! was born. 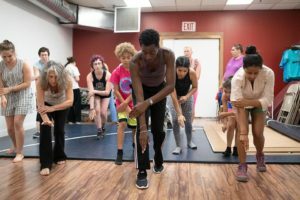 A collaboration with Jacob’s Pillow, Working Cities Pittsfield (Berkshire Bridges – A Working Cities Initiative), and Angela’s Pulse artists & dancers, as well as several other partners, including Manos Unidas, NAACP, and many local residents. Our charge was to create an original performance drawing from the people and stories of Pittsfield and the surrounding region. Angela’s Pulse (AP) worked with us over a 6 month period, spending time in the community, attending meetings, visiting with residents, and asking the questions: How does your community move? What makes it stop moving? What gets it moving again? 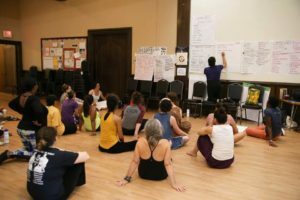 Over ten days in July, those questions were deeply considered in workshops throughout the city where dozens of local residents from all walks of life participated. Key to the partnership was keeping with the Working Cities promise of valuing resident input and participation. Answering that promise, Jacob’s Pillow budgeted to pay participants of the project for their time and input into the creative process. Everyone who provided their valuable insight and creativity was paid for their time and expertise. Really. The outcome? A beautiful, soulful, performance (in progress) by residents, for residents. Pittsfield Moves! was performed on the outside stage at Jacob’s Pillow on July 26 and again at the Gather-in festival in Durant Park on July 28 for the community. And yes. The answer is yes. You can build community through movement. Pittsfield Moves! is a year-long project. Angela’s Pulse will be back in September, October, and November to continue the work. We will keep you posted on opportunities to get involved. Click here to view a short video on Facebook of part of the performance at Jacob’s Pillow. A full version will be available soon to share.